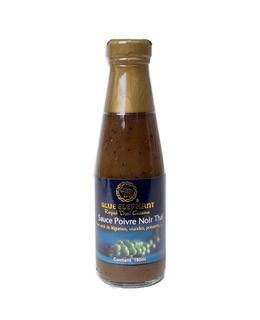 This Black pepper sauce made by the Blue Elephant House is a seasoning for sauteed dishes with chicken, beef or pork. 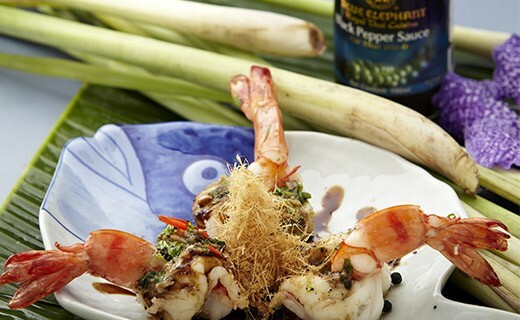 Water, sugar, soy sauce (soybeans, wheat, water, salt), salt, thickeners (E412, E1442), rice bran oil, garlic, pepper 1,6%, shallot, flavor enhancers (E621 , E627, E631), citric acid (E330), caramel (E150c), preservatives (E202). To flavor preparation stir dish with chicken, beef or pork.